The Capitol is the heart of Austin. Completed in 1888, the red granite and limestone building is a reference point from almost any angle as you enter the downtown area. By law, the view must be clear on all sides, meaning that no tall buildings can block the protected Capitol sightlines. Thirty view corridors, each with secondary sightlines, converge on the Capitol from major Austin landmarks and vantage points. With the fast-paced growth of the city and developers eager for additional residential and commercial projects downtown, the City Council has formed a committee to evaluate the sightlines, with the possibility of eliminating some of them. For close to 25 years, these legal protections have ensured continued views of the State Capitol, the most prized and recognized symbol of Austin, and today they are more relevant than ever. With the action of the Austin City Council, these Capitol view corridors are endangered. The views are priceless and any modification to the view corridors would endanger a treasure that belongs to all Texans. Update: Efforts driven by local development desires threaten the existing Capitol view corridors (CVCs) are unprecedented in scope and come on a number of fronts. For a full quarter century, responsible developers have respected the view corridors when pursuing their development projects in Austin. Unfortunately, the CVCs are being targeted in various venues, from local to state. 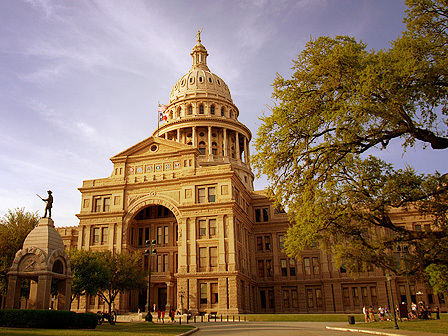 On May 10, 2007, 140 members of the Texas House of Representatives sent a letter to Will Wynn, Mayor, City of Austin, and the City Council expressing their concern about the potential elimination of the Capitol view corridors. In June, the Downtown Commission voted to forward the report, “Downtown Development and Capitol View Corridors” to the Austin City Council.” The report recommends possible revisions and the study of 11 of the 30 view corridors. The Downtown commissioners plan to present their report to the City Council at the October 11 meeting. In addition, the commissioners plan to meet with the Austin delegates to the state legislator. Local preservation organizations across the state have voiced their opposition to wholesale revisions to the CVCs. The San Antonio Conservation Society, Preservation Dallas, Victoria Preservation, Inc., Greater Houston Preservation Alliance, Williamson County Historical Commission, Historic Waco, Historic Tyler, Galveston Historical Foundation, Historic Fort Worth, El Paso Historical Commission, Abilene Preservation Alliance, Historic Amarillo, Historic Mesquite, Historic Houston, and others have joined the Heritage Society in opposition to the proposed revisions. For more information please check the Heritage Society Austin website.